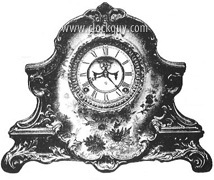 American Shelf Clocks ~ Antique Clocks Guy: We bring antique clocks collectors and buyers together. 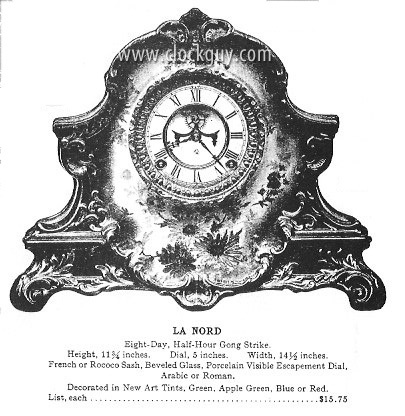 Always the highest quality antique clocks available. Note: most wood-cased American shelf clocks are in the lower section of this page. 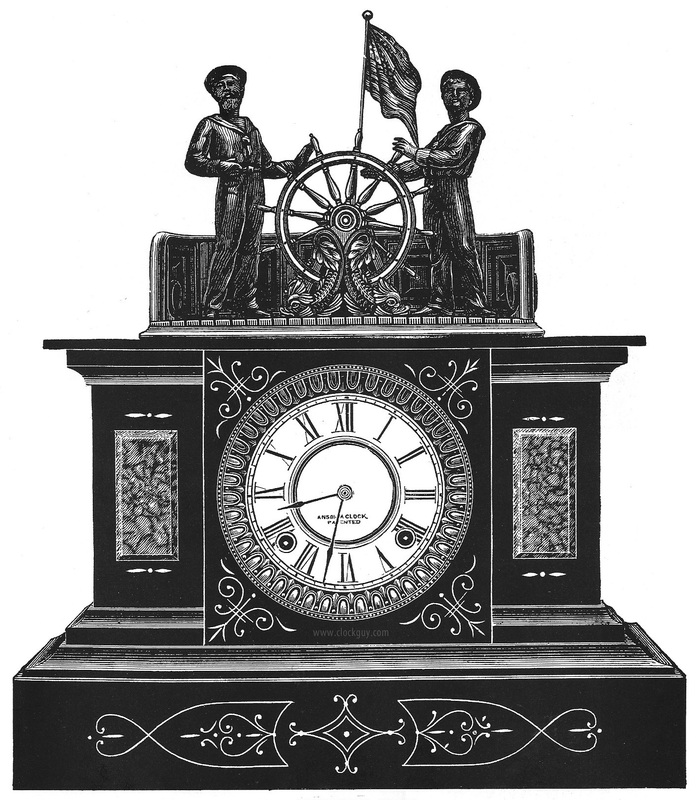 The black enameled iron case is topped with two helmsmen with dolphins at the fore and flag at the stern. The ship's wheel moves back and forth between the hands of the sailors. 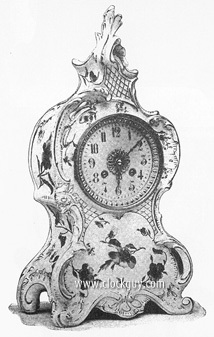 Here is one of the most visually pleasing of the wide variety of German Royal-Bonn porcelain cases made for the Ansonia Clock Co. of New York. The very special and unusual gray-green color of this clock makes it extremely desirable. Physical: The porcelain case is in excellent physical condition without repairs. It measures 14.5"w x 11.75"h x 5"d. The 5" diameter porcelain dial with exposed escapement is also in excellent physical condition. Mechanical: The eight-day, spring-driven movement with exposed escapement (with jeweled pallets) was recently professionally overhauled and is in excellent mechanical condition, ready for years of great service for you. Comments: This is a gorgeous clock that will go blend marvelously with most color schemes in your home or office. Give us a call to start the process. Here is another beautiful Ansonia clock created by the famous and sought-after Royal Bonn porcelain works in Germany, c.1904. This particular design was made in numerous colors and was also available with a Dutsch scene on the front. Physical: The porcelain case, which measures 15"w x 14.5"h x 5"d is in excellent physical condition without breaks or repairs. The 5" porcelain dial is also in excellent original condition. The case bears the Royal Bonn signature on the back. Mechanical: The eight-day, time-and-strike (gong) movement was professionally serviced in late 2012 and is in excellent running order. Comments: Many of the green-colored cases from Royal Bonn tend to be a yellowish-green-lime color; this one's a much deeper and prettier shade of green. Its condition speaks for itself. Now you need to speak up and tell us you have just the place to put it! 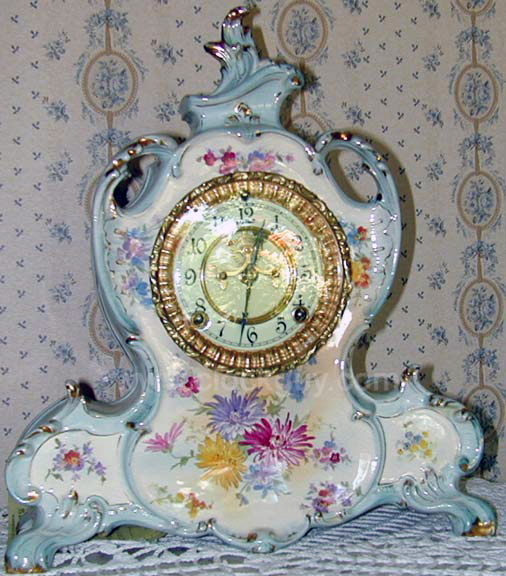 Here is one of the sought-after Ansonia clocks in a porcelain case signed both "Royal Bonn" and "Delft". The history of each of these firms is linked in the previous sentence and makes for interesting reading material. It is interesting to note that Royal Bonn made numerous pattern configurations for most Ansonia models as you can see here with the floral catalogue design; but even that design was likely made in multiple colors/configurations and with different dials as you can see here. Physical: The porcelain case is in exquisite original condition. It measures 7.5"w x 15"h x 5"d. The tiny 3.5" diameter porcelain dial is in excellent condition and has floral designs between the numerals. The hands are correct and original. There is a slow/fast adjustment arbor above the numeral 12. Mechanical: The movement has been recently professionally serviced and is in excellent running order. Comments: We strive to find great items at fair prices for our clients. This model was recently seen in a very high-end antique center priced at $3,250. Ours is a little more reasonable... and waiting for your call. 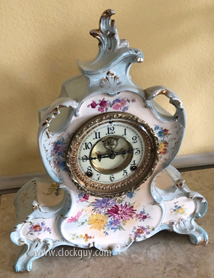 Physical: The porcelain case is in excellent original condition and measures 13"w x 13.5"h x 5"d. It has a 5" diameter dial with exposed jeweled escapement and a "rococo-style" sash with original beveled glass. UPDATED:And, speaking of the beveled glass, if you look at the front photo you will see it causing an optical illusion of sorts at the upper right corner of the bezel where thare might appear to be a white gap as if the bezel was open. That is the beveled glass tricking the camera into seeing the dial where the bezel is! Check this photo for clarification. Mechanical: The eight-day time-and-strike movement strikes a mellow gong on the half hour and the hour. 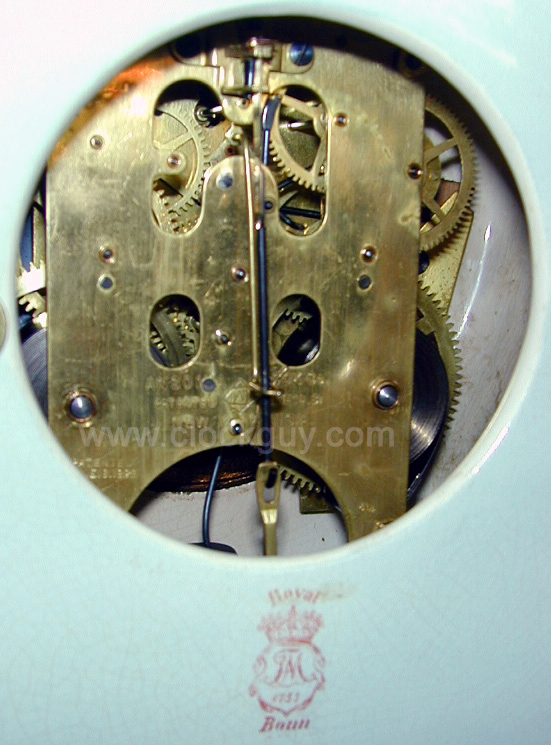 The movement was professionally overhauled in 2010 and is in excellent running order. Comments: Give us a call to start the process for this one... or perhaps the entire collection! "Imported, Hand Painted and Gold Decorated Cases, Fitted with the Ansonia Clock Company's Eight Day, Half-Hour Strike, Cathedral Gong on Sounding Board, Round Polished Brass EScapement Movement, Ruby Pallets, Rack Strike, with Patent Regulators and Striking Parts, and Either Porcelain or Gild Dials." Physical: The high-quality German "Royal Bonn" porcelain case is in excellent condition and measures 13"w x 14.5"h x 5"d. The 5" dial is also in excellent original condition. 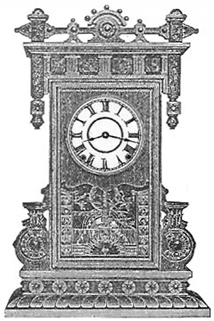 This clock has Ansonia's fancy sash (bezel around dial) and beveled glass. The porcelain has typical "alligatoring". Mechanical: The eight-day, cathedral gong-strike movement is in excellent running order and features an "open escapement" visible on the dial. It strikes on the half-hour and on the hour. The movement was professionaly and thoroughly overhauled in April 2003 and had 14 new bushings installed.The clock will be professionally lubricated once again, prior to shipment. Comments: We don't list a lot of porcelain clocks because many of them offered to us are either pedestrian in design, overtly common, or are in chipped-up condition. This is another wonderful exception. Seth Thomas made a group of clocks purportedly named after American cities. We have an article in our Reference Library that discusses this group of clocks. 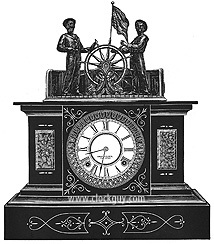 The "Beloit" model, configured with an alarm like this particular clock, originally sold in 1896 for $11.14. Today, it's a little more expensive! Physical: The walnut case, with original finish and stenciled glass, measures 14.5"w x 22.75"h and is in excellent physical condition as you can see in the numerous photos below. The 6" diameter dial with original paint has the numerals "strengthened" as they were faded. 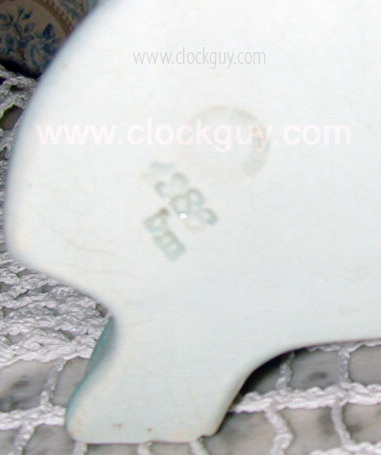 There is an original factory production date stencil on the back indicating this clock was made in March 1886. Mechanical: The eight-day cathedral gong-strike movement was recently professionally overhauled and is in excellent running condition. It also features an alarm that is set by the small subsidiary dial in the middle of the main dial. Both the movement and alarm function properly (but we'd prefer awaking to the quiet sounds of our iPhone playing music of our choice)! Comments: Great clock made available to us by a major collector, and at a wonderful price. Give us a call to make it your own.